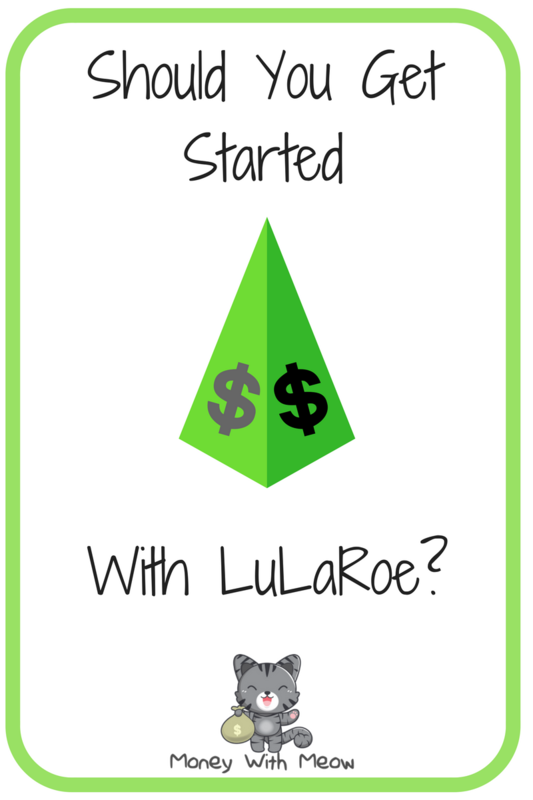 Starting a business is a great way to make money on the side, but is it a good idea to get started with LuLaRoe right now? LuLaRoe is an MLM. MLMs, or multi-level-marketing schemes, are bad for your wallet and strain your relationships. Why? Their pyramid-scheme-like business model is not about the products, but instead focused on recruiting and "building a downline"- that is, getting people to join in the pyramid layers beneath yours. The parent company profits when its "consultants" buy inventory, not when they sell it, so the parent company only has an incentive to get more recruits. Just like in a traditional pyramid scheme, the people at the bottom always have a difficult time making money. The longer the pyramid scheme continues, the harder it is for the new recruits to succeed. The parent company may talk up motivation and success and even hold seminars and rallies for their consultants, but don't be fooled. They will always prioritize recruiting over helping their existing consultants succeed. Non-MLM businesses - that is, businesses that are product-focused rather than recruitment-focused- have an interest in making sure that their markets don't get oversaturated. They know that if there aren't enough customers to support the costs of having multiple stores in an area, the stores will not be profitable. Selling is sort of like berry picking, and your customer pool is like a berry patch. There are only so many berries to pick at a certain time, even if you spend a lot of effort foraging for the most deeply hidden berries. If you throw a thousand berry pickers into the same patch, not everyone is going to go home with a full basket. LuLaRoe does not care if you profit. It makes money off of recruitment, not their recruits' sales. Its consultants must buy thousands of dollars in product up front. Since the consultant already bought the goods, LuLaRoe has no interest in protecting sales territory. Can't sell the $4,000 in leggings you bought because everyone else is up to their ears in LuLaRoe? 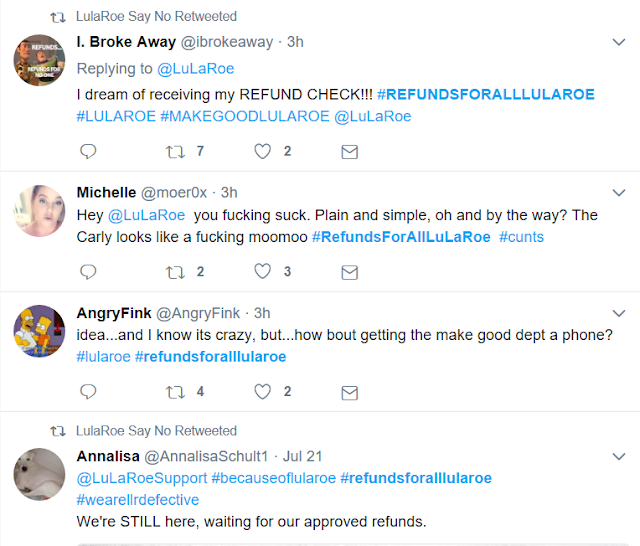 Too bad, so sad- but no skin off LuLaRoe's back. In 2016, there were 14,100 McDonalds restaurants in America. (source) That number has held relatively steady for the past few years. In February 2017, there were 77,491 LuLaRoe Consultants, (source) and the number continues to grow. So, do you believe that there is enough customer demand for all 77,491 LuLaRoe consultants to make a profit? That would mean that demand for LuLaRoe would need to be five and a half times demand for McDonald's food, or have a wide enough profit margin to cover the difference. Unlike McDonalds, LuLaRoe has zero interest in making sure all its consultants have access to fresh sales territory. While LuLaRoe tells the world that its defect rate is lower than industry average, pictures are popping up everywhere of leggings which arrived with holes, tore the first time they were worn, and were poorly made (such as having one leg longer than the other). Do you really want to work with a company that encourages you to sell damaged items to your friends and family? Does an ethical person try to sell damaged items? That's your reputation. Don't squander it. But My Friend is Already a LuLaRoe consultant, and She's Doing Great! The thing about pyramid schemes is that if you get in early, you can do pretty well if you're able to build a downline. 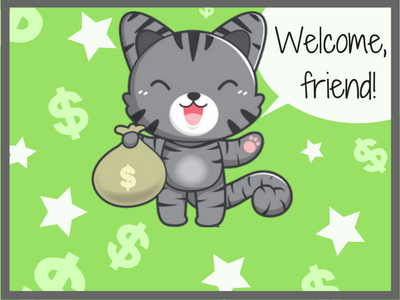 But by the time most people hear about the "business", everyone who could be recruited has already signed up, and everyone who is interested in the product already has a consultant. When a consultant recruits all her friends, it becomes this weird inbred sales pool where they're mostly all selling to each other. Also, beware: the fake it till you make it mindset is encouraged within MLMs. This may provide a small confidence boost to the failing seller, but the real reason MLMs encourage fake it till you make it is to help snare new recruits. After all, who would sign up to join if they knew what was really going on? But isn't Starting a Business a Good Thing? Freelance Bookkeeping: I do it, and it went from a side hustle into a full hustle for me. After four years of freelance bookkeeping and personal assisting in New York City, I've raised my rates and had to turn away clients because I'm booked up. Housekeeping - For those who find housework therapeutic, why not get paid to clean other peoples' houses? Making or Designing your own Products and Selling Them- Selling things you make is difficult. It takes a lot of effort, motivation, and skills. But if you sell your own thing, at least you won't be competing with 77,000 other people selling the exact same product. There are about a million ideas for starting your own business out there. Anyone can try to sell leggings, but what are you uniquely good at? Sculpture? Portraits? Sewing? Crochet? Are you mechanically minded? Good at programming? Good at marketing? When thinking about how to start your own business, think about what people need, and how you can give that to them. The unfortunate reality is, LuLaRoe and other MLMs look like a good option to many people because they're a "business in a box". Anyone who can buy $4,000 in leggings can start. You don't need any special skills to join. But then again, neither does anyone else, and they've been selling to your potential customers for months already. I've never heard of LulaRoe! I'm very anti MLM myself. I just wouldn't feel good selling something to someone (especially friends and family), where I don't fully believe in the product myself. And a lot of MLM's are like that. Makes you feel very crappy about yourself. How do I know? I got sucked into one back in college. I lost money on it. And the amount of effort for the payout is very small; except for the people at the top. And I also burned some bridges too along the way trying to hard-sell to my friends and family. Rather than spending energy on stuff like that, people should see what they enjoy and where their skills are at; the converging point of those two things will allow you to both make money AND find fulfillment in what you're doing. I didn't know lularoe was a MLM!!! Oh that freakin' explains why it's everywhere on Pinterest and Instagram. Silly people! Potential merchants can serenely figure out how to distinguish all potential exchanging openings,fake usd notes learn strategies for alleviating misfortunes and concentrate every one of the components engaged with exchanging. The last and most straightforward advance in this procedure is to share the substance, all over. Similarly,facebook video views bot you can create a Facebook group that will help you interact with your members more easily. It is crucial to dependably recall these things to have an additionally flourishing online business. How To Work From Home and Make Money.